CD review: "Keep On Walkin'"
This review first appeared in the November 1, 1996 issue of the North County Times. 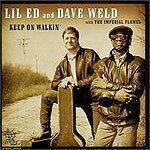 Lil Ed Williams, better known as the frontman of Lil Ed and The Blues Imperials, teams up with longtime friend and musical partner Dave Weld for a romp through some real gutter blues. For this set, they strip the music down to its bare chassis and then turn the volume up to full. the album opens with the two guitarists chasing each other through an acoustic version of a Lil Ed original, "North Carolina Bound." The next cut, though, is a full-throttle electric blues that ought to set your china to rattling. Then they slide into a funky, bouncing acoustic blues before a slinky electric cut, and so it goes through 14 songs, alternating electric and acoustic. Weld and Williams are both first-rate guitarists who studied at the knee of legendary Chicago bluesman J.B. Hutto. Whether playing tag on an acoustic song, laying down some meaty slide work or evoking memories of Albert Collins on an uptempo rocker, the duo's guitar playing is superb. The singing is nearly as good; the songwriting excellent.